Now that it’s finished, let’s take one more look at Albany’s Main Street roundabout. Looks nice, doesn’t it? On a visit to Yulie’s Bakery in the nearby Carriage House Plaza, I rounded the “about” on Monday afternoon, then stopped the truck and walked back for a closer look at the landscaping, the subject of a commentary here on Sept. 2. It looks to me as though the landscape contractor has finished his work, handily beating the Sept. 18 completion date. Anderson’s Erosion Control Inc. of Junction City had a $31,490 city contract to do the job. 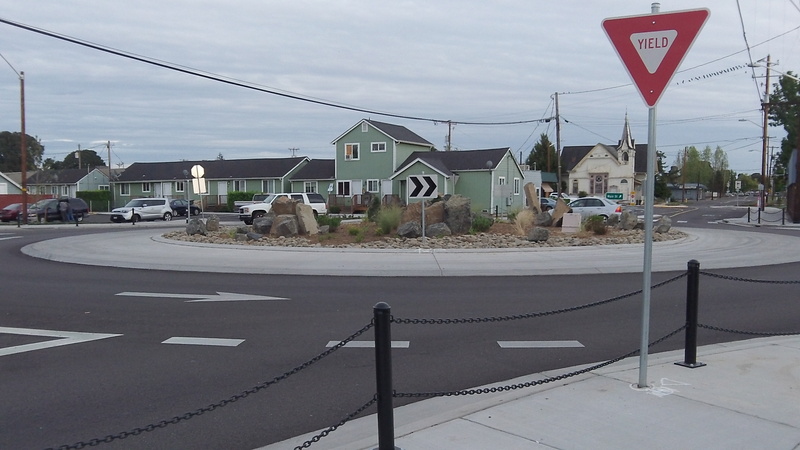 The roundabout was constructed in 2014 as part of a $1.8 million Main Street rehabilitation project intended to solve a major congestion problem. It has done that. Traffic now flows where it used to hang up during parts of the morning and afternoon. This guy, wisely, looks ahead and ignores the landscaping. I’ve noticed that the landscaping seems to just disappear causing you to pay more attention to traffic in the roundabout rather than looking across. It didn’t look like much to start with but turned into almost an attractive sight. Not beautiful but very functional. I don’t often give kudos to the city, so it pains me somewhat to admit that this roundabout is a great improvement over the previous traffic control at a very busy intersection during rush hours. And the decision to ignore the CARA plan to spend $130,000 decorating the roundabout was a good one. 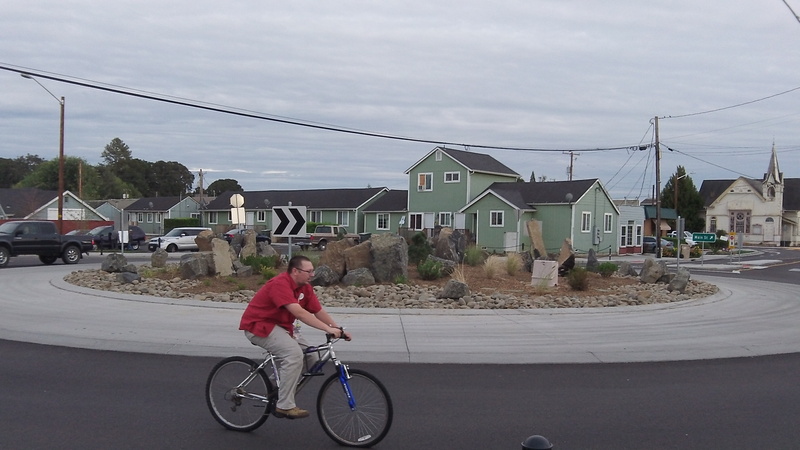 The rock landscaping looks just fine and came in $100,000 less than the CARA design. The city is a target rich environment for stupid decision making. This ain’t one of them. I don’t want to get picky, but when CARA asked for bids on a design they liked that included expensive signage, that was a pretty good indicator of what the CARA board favored. To her credit, Kate realized that going down this path at the bid price of $130K was pretty stupid politically and recommended against it. When Kate bailed, the CARA board effectively had no choice but to scale down their favored design. The bottom line: Common sense prevailed in an environment where common sense is rarely exercised. Kudos to all involved. I will second everything said by Gordon, and Hasso’s point below is well taken. For ONCE this is a good outcome for city government and their decision making. Now if we could only get them to do things this way consistently…….?? OMG! The end days must be near! Don’t get too crazy. According to the city attorney, we can’t kill CARA so we have no choice but to live with it. I’m simply putting lipstick on the pig. CARA still violates the principle that one taxing entity shouldn’t take revenue from another taxing entity without permission. And this “investment” generates zero tax increment, a violation of CARA’s promise to increase the property values downtown. I could go on ad infinitum, but I won’t. It does not surprise me at all that you carry a supply of lipstick, Gordon, pig or no pig. There is no such principle, and in all your ravings, threats, mischaracterizations, and downright false statements you have NEVER been able to prove a single point where CARA has violated the law. EVER. CARA follows the law, nothing more nor nothing less. So try telling the truth some time. You might find it redeeming. The legislature recently changed how Urban Redevelopment Districts secure funding. It’s a moral principle we all learned in kindergarten – Don’t take other people’s stuff. And I would add – Don’t create an urban renewal scheme without voter approval. And we also learned in kindergarten to share with others and help each other out. That is what government is, and you hate it. Really Bob? Sounds more like a definition of either: charity, or wealth redistribution, which is a favorite concept of the far left, and clearly NOT the proper role of government as designed by our founders. You come up with some pretty weird stuff, Bob. I think CARA “wisely chose the less costly alternative” because that means $100k more it can spend downtown. I fear, as the foliage grows, us poor bicyclists are going to have cars coming upon us way too fast, because they didn’t know we were there. The disappearing bike lane is scary. It leads you in and then vanishes, leaving you and a car a trying to occupy the same space. Bill, I would suggest, if you don’t already, stay on the right of the traffic lane, and signal your intentions to exit, just as cars should. They’ll be watching out for you if they have any sense because we all know bicycles have a right to ride in a traffic lane and that bicyclists are required to use the same rules of the road as cars. And if that doesn’t work, then by all means, get off the bike and walk it on the sidewalk using the pedestrian facilities, which are ample and well designed. Just my $0.02 worth. Happy (safe) riding. Bad advice because some drivers will “squeeze” you to the curb. When there is no bike lane, you take the lane and the car has to follow until it’s safe to pass. The problem is there IS a bike lane that disappears, merging you right in front of/into a car. IF ALL drivers knew the rules and drove prudently, it wouldn’t be such of a problem. With immature/speeding drivers driving through the round about as a “speed challenge”, the potential for injury/death is very real. Smaller/sportier cars provide less vision from both the driver/cyclist. As the foliage grows, things will get worse.